Elixir Medical Corp. (Sunnyvale, CA) is the first company to offer both durable and biodegradable platforms for drug-eluting stents. A proprietary annealling approach boosts crystallinty and strength for its plastic stent. The company announced that it now has CE (Conformité Européenne) Mark approval for its DESyne BD Novolimus Eluting Coronary Stent System for the treatment of coronary artery disease. The Novolimus Eluting DESyne stent is based on a cobalt chromium platform. 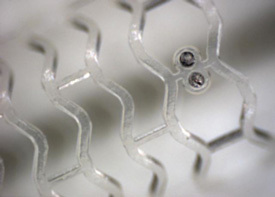 “The combined attributes of lowest polymer load, lowest drug dose, and thin stent struts provides physicians with a state-of-the-art workhorse product that raises the bar for treating patients with coronary artery disease,” said Alexandre Abizaid, co-principal investigator from the Instituto Dante Pazzanese de Cardiologia in Sao Paulo, Brazil. The Elixir DESyne BD stent uses a proprietary technology to enable an ultrathin (< 3 microns) polymer coating without the need for an underlying primer layer. The company also offers a fully bioresorbable drug-eluting scaffold, called the DESolve Bioresorbable Coronary Scaffold. The DESolve Bioresorbable Coronary Scaffold System is made from a PLLA-based polymer and coated with a polylactide-based resorbable polymer-drug matrix. It uses the same polymer coating and low drug load as the DESyne and DESyne BD. The DESolve Scaffold will soon be studied in a study enrolling 120 patients at up to 15 centers in Germany, Belgium, Poland, Brazil and New Zealand. U.S. Patent 8,182,890 was awarded in May for the company’s proprietary polylactide-based technology to enhance the strength of a bioresorbable stent by increasing crystallinity through annealing without substantially increasing the biodegradation time. After modification, crystallinity is increased by at least 20% of the original crystallinity of the amorphous material. Elixir Medical is a privately funded company formed in 2005. The lead investor is the Invus Group, a New York-based equity investment firm with more than $4 billion under management.